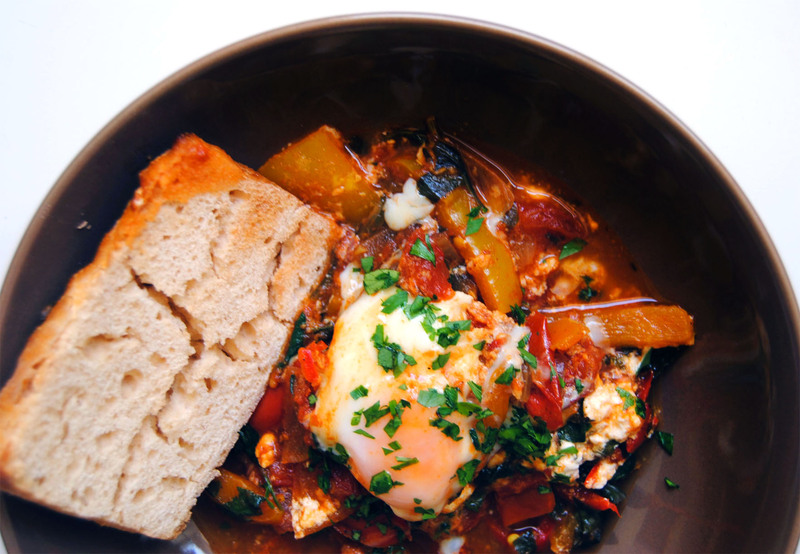 Poached eggs in a rich, spicy tomato sauce with plenty of vegetables and greens. This one-pot meal is ideal for sharing with friends. Several years ago, I was traveling in Morocco with a friend of mine and we decided that instead of staying in a hotel, we’d try Couchsurfing. We stayed with a very lovely family in a small village near Fez and while only the son spoke English, the whole family was gracious and welcoming. It was a wonderful experience, and for me, the best part was eating dinner with the family. The mother would cook dinner in one very large pot, and then the whole family (and their two American guests) would gather around and eat from the same very large pot. We sat on cushions on the floor, and didn’t use plates or silverware; instead, we’d use our hands and pieces of bread to scoop up the delicious food right from the pot. The family teased me and my friend, because we didn’t “know how” to eat with our hands. I loved eating that way, though, even if I wasn’t “good at it”! In general I love sharing a good meal, so why not share the dish as well?! Even if you choose to eat it on separate plates, don’t you just love a one-pot meal? It seems like all the best comfort foods are one pot meals: chili, macaroni and cheese, soups, stews, and casseroles. Not only are these meals delicious and easy, but they’re wonderful for sharing, whether with one other person or twenty, I’m not sure what I find more comforting: the meal itself, sharing it with friends, or the fact that I don’t have to spend an hour washing the dishes and can curl up on the sofa instead. Let’s face it – that’s pretty comforting. 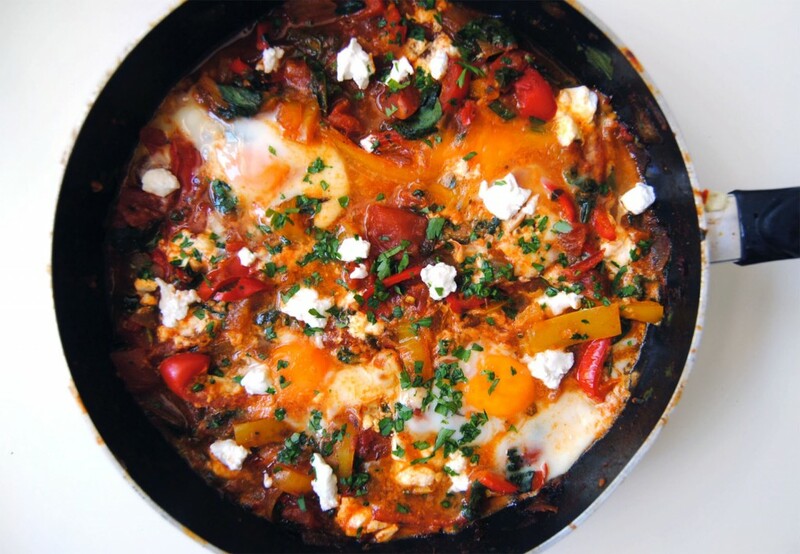 I’ve seen many, many recipes for Shakshuka and I was drawn to each and every one of them. One pot, poached eggs, lots of tasty sauce… what’s not to love? There are many different variations, the most basic of which is really just eggs poached in a simple, spicy tomato sauce. I was even more drawn to the others, though, which include vegetables such as eggplant or peppers, along with greens and fresh herbs. I’m a sucker for fresh herbs. This is yet another dish that is infinitely adaptable. You can add any vegetables that you want, make it more or less spicy, substitute the spinach for kale or leave it out entirely. You can make this in a large pot, as I did, or in individual ramekins which would be adorable. Rather than poaching the eggs stovetop, you can also do a baked eggs variety and put the dish in the oven. A cast-iron skillet would be perfect for this. One of my eggs broke (top right – yuck!) so it wasn’t quite as beautiful as it could have been, but it was still very tasty! Just be careful not to break or overcook the eggs – the runny yolk is really the best part of this dish, as it mixes with the spicy sauce and mmmmmm. Heat oil in a medium, deep skillet. Sauté onion over medium-high until translucent. Add garlic, bell peppers and chili pepper and cook for about 2-3 minutes. Add the sugar, spices (except cayenne) and thyme and cook for another 5-7 minutes, until everything is soft and a bit caramelized. Add tomatoes and tomato paste. Taste, and if you feel like a little extra heat, add a pinch of cayenne. Reduce the heat to low and cook for 15 minutes. Add a bit of water every so often, to maintain a pasta sauce consistency. Stir in the greens and cook for a minute or two until wilted. Taste and adjust the seasoning. When the sauce is just perfect, make 4 gaps in the pepper mix and break one egg into each. Sprinkle with a bit of salt and cover the pan with a lid, then cook over very low heat for about 8-10 minutes until the egg whites are set but the yolks are still runny. Top with chopped parsley and feta, and serve with bread or rice. This is my second recipe from your awesome collection – it was truly delicious! Even though I cooked the eggs a bit too long, my family was delighted. I am more determined than ever to work my way through all of these recipes, one by delicious one! Love your blog! Just found you on insta and followed you here. Lovely! Thanks so much for your lovely comments, here and on instagram. I love your blog, the photos are gorgeous and the food looks amazing! !